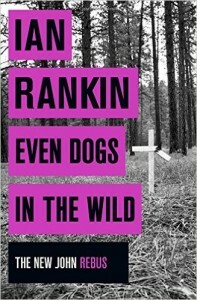 On Thursday 19 November 2015, Ian Rankin was in town for the Ottawa International Writers Festival to talk about his new book, Even Dogs in the Wild. In the 20th installment of the Inspector Rebus series, John Rebus comes out of retirement to help detective Siobhan Clarke investigate the death of a lawyer during a robbery. Ian Rankin was interviewed by Peggy Blair, a local crime writer who got her break thanks to a chance meeting with the Scottish author. 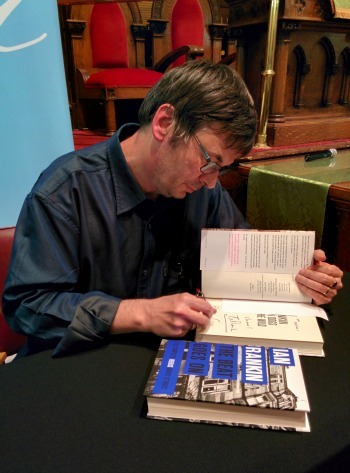 During the talk, Ian Rankin told the audience about how he got into writing. When he was a child, he initially wanted to write comic books but wasn’t very good at drawing. Then he wanted to be in a band, but he had no musical abilities. Finally, in his last year of high school, he wrote a poem called “Euthanasia” and won second place in a contest, and that’s when he decided to be a writer. Later, for his PhD in Scottish Literature, he was supposed to write a thesis on Muriel Spark but instead wrote his own books. He never finished his studies but made progress in his goal of becoming a writer. When he started sending his work to publishers, he sent manuscripts because he couldn’t afford to photocopy his novels. His first book never saw the light of day though. For his second novel, The Flood, he initially contacted Scottish publishers, but they were not interested. Then he sent his book to London publishers. One of them accepted it and published about 200 copies of the work. Later, an agent got interested and contacted the author. However, he only realized he was a crime writer when the Crime Writers’ Association got in touch with him to ask him if he wanted to be a member. Ian Rankin recognizes that the publishing world has changed a lot since the 1980s, and he wouldn’t know how to give advice to new writers. Self-publishing is very common now, and the advent of ebooks has radically affected the industry. In addition, book promotion used to be the publisher’s job. Now writers have to be on social media in order for their books to sell. As for the series, Ian Rankin told the audience that Rebus came almost fully formed when the author was 24. The character aged along with the series and, since he is now 65 years old, Rebus cannot use his physical strength anymore and has to rely on his wits and guile instead. When asked if there will ever be a romance between Rebus and Siobhan, the writer bristled and said that it will never happen as Rebus is old enough to be her father, and they are just colleagues. The author is still intrigued by his main characters though and that’s why he keeps writing about them. So we can expect to read more books about Rebus and co. When the author is at the airport, he checks if his books are on the shelves. If they are, he moves them to the front. He compared the Harry Potter series to a crime novel. As a result, he was not surprised when J.K. Rowling wrote the Cormoran Strike series. In his first draft of Even Dogs in the Wild, there was no dog, but the title was already set, so he had to revise the story to include a dog. His wife is always the first one to read his writing. She gives him advice and keeps things real. Rebus’ musical tastes are partly Ian Rankin’s. However, the inspector mostly listens to oldies because he’s 65. The fact that he prefers the Rolling Stones over the Beatles is a way of showing his personality.